An accident can have a variety of effects on an individual. 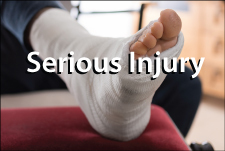 Serious injuries, however, can be complex and devastating. These injuries can change the way an individual lives, works and enjoys the rest of his or her life. If your injuries are a result of the negligence of another, you could be entitled to compensation that could help you cover costs associated with medical bills, ongoing treatment, property damage, lost wages and pain and suffering. At Chambers & Noronha, our attorneys have extensive trial experience. We are fully prepared to aggressively litigate for each of our clients and our opponents are well-acquainted with our reputation. Our approach to personal injury law helps our clients minimize risk and maximize access to an outcome that serves their best interests. Regardless of your catastrophic injury and its complexity, we are committed to helping our clients obtain an outcome that will support a brighter, healthier future. We make an investment on behalf of our clients so they can proceed with confidence. We will not charge any fees until or unless we obtain compensation for you. To schedule your free initial consultation with one of our serious injury lawyers in Santa Ana, please email us or call 714-558-1400.